Nisg̱a’a youth from the Nisg̱a’a villages of Gitlax̱t’aamiks, Gitwinksihlkw, Ging̱olx and the Nisg̱a’a Urban Locals of Prince Rupert-Port Edward and Terrace participated in a Nisg̱a’a youth engagement meeting themed ’Strengthening Youth Engagement’ at Nisg̱a’a Lisims Government today. The days’ agenda included a welcome and opening comments from President Eva Clayton and Secretary-Treasurer Corinne McKay, a morning presentation from Sim’oogit Hleeḵ - Dr. Joseph Gosnell on language, culture and history of the Nisga'a Nation that ended with a question and answer session between Hleeḵ and the youth. In the afternoon, Coordinator Leslie Robinson provided a Nisg̱a’a Youth Engagement legacy plan and youth had the opportunity to offer their ideas and feedback. 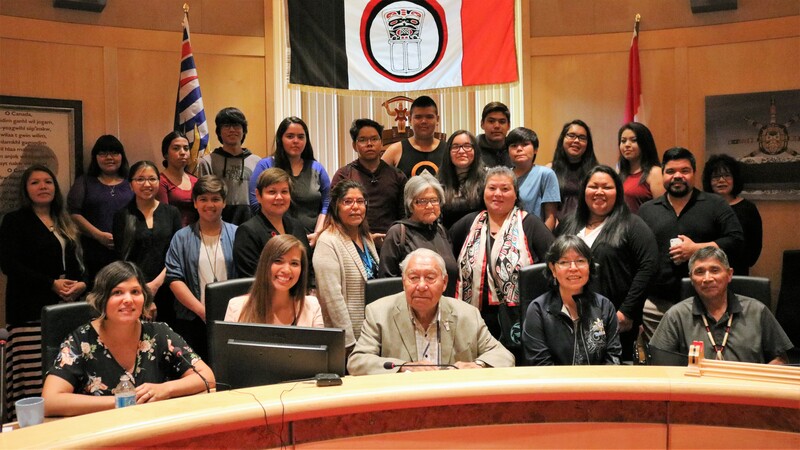 Representatives from each of the communities provided updates on local youth initiatives and discussions also took place in the area of Nisg̱a’a language and culture revitalization. The youth then met Nisg̱a’a youth role model Marcia Dennis to hear her story of becoming and being a Registered Nurse. Nisg̱a’a Youth Engagement Coordinator Leslie Robinson is establishing an evolving network of Nisg̱a’a Youth who are interested in youth engagement in Nisg̱a’a Government, Nisga’a language and culture and those who seek assistance and guidance with accessing government programs and services. Leslie has an open door policy to all Nisg̱a’a youth ages 15-29 who wish to learn about and get involved with ongoing Nisg̱a’a youth engagement initiatives. Leslie can be reached in the Communications & Intergovernmental Relations department at Nisg̱a’a Lisims Government in Gitlax̱t’aamiks.